Yesterday, I wanted to give the family a treat, so I bought some cones and ice cream. I had seen that this little box held sixty cones, and wondered how they fit them all in there…what economy of packaging, I thought! 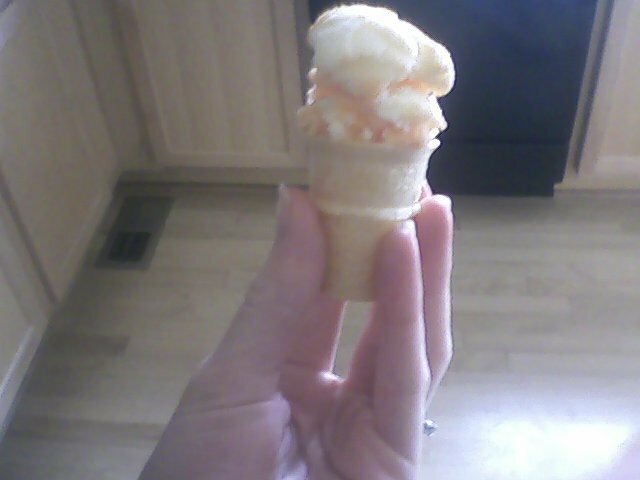 I didn’t know you could buy such a tiny little ice cream cone. These pictures from my phone don’t do the tiny-ness justice. I let the kids have two cones. They were so excited…maybe I’ll mini-size more often. I shall not divulge how many cones I ate, however. This entry was posted on April 20, 2010.
haha! That sounds like turning lemons into some sweet lemonade! I love those cute little cones, I'm going to try to find some around here, what a fun little summer treat! We had ice cream cones of this size today when we stopped at Burger King for lunch after leaving the doctor's office. They sure do make nice little treats!